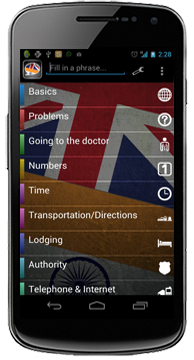 We have released 2 new Talking Phrasebooks for the Android™ platform. Now you’re able to get Talk Hindi – Phrasebook for English and Talk Urdu – Phrasebook for English. These 2 apps are what you need if you want to be understood while travelling through India or Pakistan! You can also use them to impress your Hindi or Urdu speaking friends. Both apps contain over 290 phrases in 14 different categories. From going to a bar or club at night, to visiting the doctor the next morning, Talking Phrasebooks are there to aid you. All you have to do is search for whatever it is you want to say, and play it properly pronounced from your device. Get yours for only $1.99 on Google Play. These apps are compatible with all devices running Android™ 1.6 and up.